Hey, someone is drinking this! Moculta dairy farmer Andrew Koch has navigated his fair share of challenges, including bushfires, pricing battles and more. Food safety is another area that throws up regular challenges, but Andrew says mindset is key. “I think it’s vital to have in your mind, every time you go into the dairy, ‘hey, someone is drinking this’. I think it keeps you in the right frame of mind to get the quality you need,” Andrew said. Andrew is the third generation of the Koch family to farm at the 800-acre Moculta property, Glenunga Holsteins. 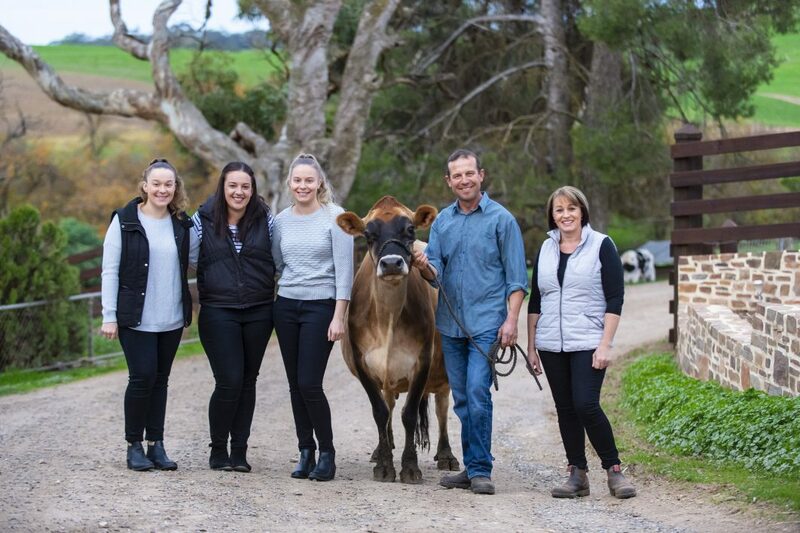 He runs 240 cows, mostly Holstein Friesians, with his wife Angela and three daughters, Ashleigh, Taylah and Courtney. Taylah, Ashleigh, Courtney, Andrew and Angela Koch. “I’m not doing anything out of the box when it comes to food safety. I just make sure I do everything properly – I don’t cut corners,” Andrew said. “We use a whiteboard system for keeping track of activities. For example, if a cow is treated with antibiotics, she’s marked with paint and then it’s recorded on the whiteboard for all to see. “And I have a built in insurance policy in the form of three small vats, rather than one large milk vat. If I have a whoopsie in terms of temperature or antibiotics, I only lose one vat of milk, rather than the whole day. 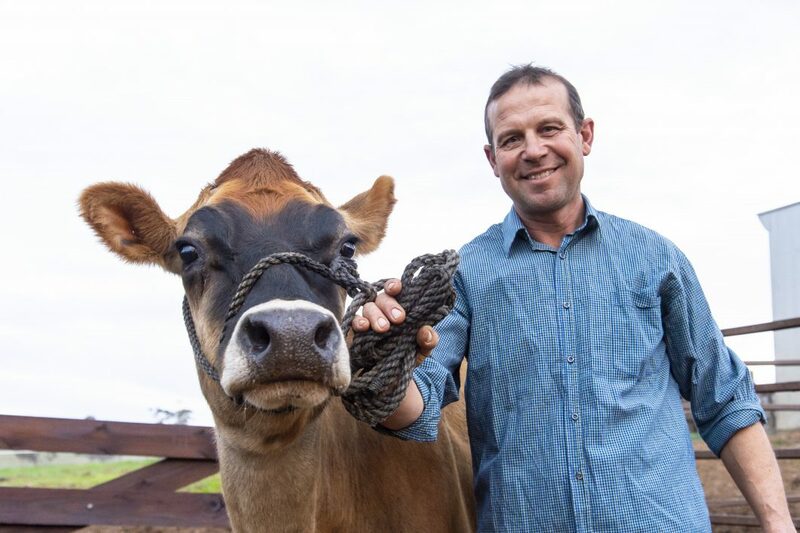 In 2015, tired of the poor milk prices being offered by major processors, Andrew was part of a cooperative of SA dairy farmers who negotiated a deal with Woolworths to supply milk directly to create the ‘Farmers Own’ brand in SA. More than three years later, the brand is performing well. The farmers in the supply group are also members of the Barossa Mid North Dairy Cooperative, but are registered separately as a collective bargaining group to supply Woolworths direct. “It’s great to have a consistent price locked in and it’s really nice to know where our milk goes. Some consumers now are really concerned about farmers and they want to help. In the past it was impossible for me to tell them what milk purchase would directly help us. Now I can tell them exactly how they can help – by buying Farmers Own milk,” Andrew said. The deal exclusively with Woolworths has led to an increased focus on food safety for Andrew and the other farmers in the supply group. Recently, they invested in a cell count tester, which is shared by the group, and allows the farmers to identify and treat problem cows immediately. “With Woolworths, the quality controls are the strictest of any company I’ve dealt with, so I’ve needed to focus more on cell counts,” Andrew said. “The cell count tester gives us much more control over our quality. We also herd test monthly, which is tough and tests everybody’s patience, but it gives us valuable data on where our herd is at. Meanwhile, Andrew is hoping to get through this summer season with limited water supply due to the drought and has had to borrow heavily to feed the herd like most dairy farmers this year. In 2014, he lost fencing and hay, but thankfully no cows or buildings, when fires went through eastern Barossa. Andrew Koch with one of his award-winning show cows, Silverfinch.